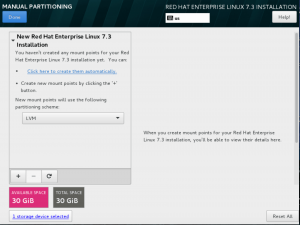 In this guide, we are about to see how to install RedHat Enterprise Linux 7.3 on a physical or virtual server in graphical mode. Before starting with installation we will cover with minimum requirements and choosing a right architecture. Below steps can be used by a newbie for training purpose which clearly furnished with step by step screenshots. 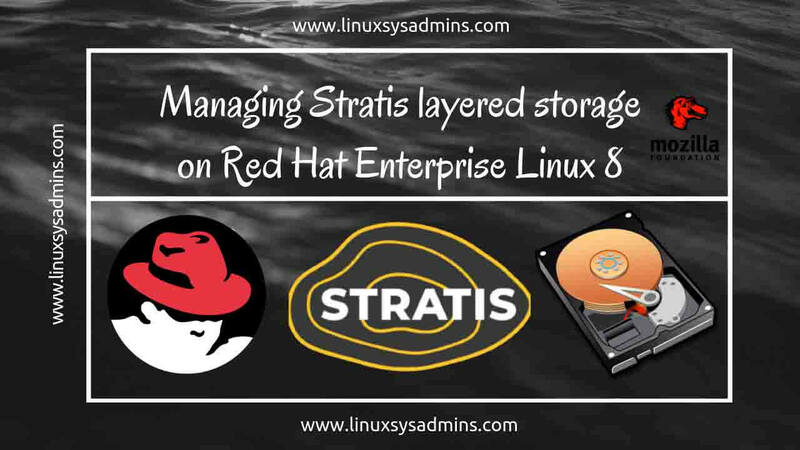 Default file system for Red Hat Enterprise Linux comes with XFS support, the maximum supported filesystem can be extended till 500TB and supports maximum 64 TB of Memory. Moreover, the default graphical desktop environment comes with Gnome 3.8. 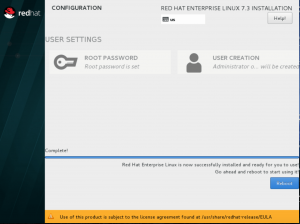 Installing with Red Hat Enterprise Linux 7.5 have no additional steps following the same steps we are good to go with installing any version or RHEL 7 releases. 10 GB minimum disk space, But 20 GB is the recommended size. 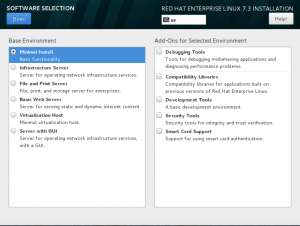 To get any version of RHEL to navigate to below URL and choose Red Hat Enterprise Linux. 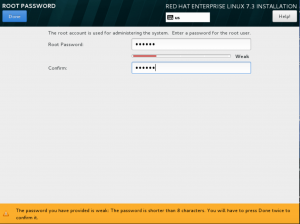 To obtain the download we need to have a valid credential in redhat.com. To start with a 30 days evaluation subscription downloads we need to have a business email ID it should not be a personal ID from Gmail, Yahoo or AOL. 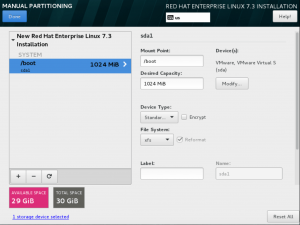 Now let’s start to install RHEL 7.3 in one of the virtual environment. 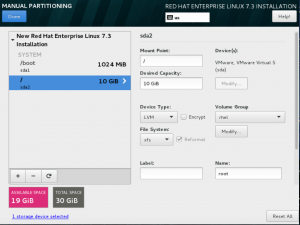 If you are trying to install RHEL7 in a physical server first we need to download the ISO and burn it in a DVD, else create with a USB bootable media to start the installation. 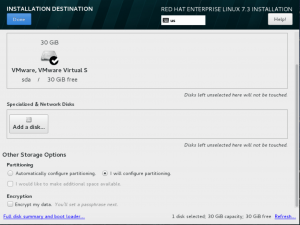 In this guide, we are about to use a Virtual machine so we are using the downloaded ISO file. 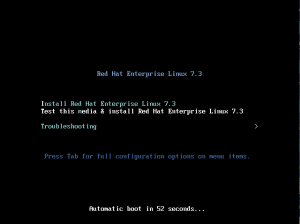 Once the ISO started to boot by default the selected option will be highlighted in second line “Test this media & install Red Hat Enterprise Linux 7.x” as shown below. 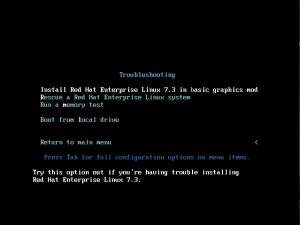 To familiar with available options in the installation screen navigate to all menus by choosing troubleshooting which will bring to know about available rescue, memory check and boot from local disk if the disk contains any operating system. Press the enter key to start the installation or wait for 5 seconds it will start the installation automatically. 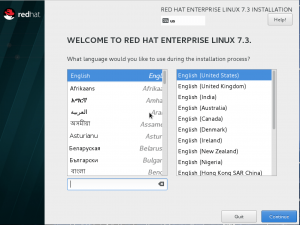 In the next screen, we will get the list of languages to choose which need to be available during the installation process. By default, United States English will be selected. If you prefer to change your require language selected from the list and click continue. In the next window, we will get an overview of the installation summary. Here we required to choose Date/Time, Keyboard layout, which language needs to be used in system level, Installation source this can be Local media, HTTP, FTP. 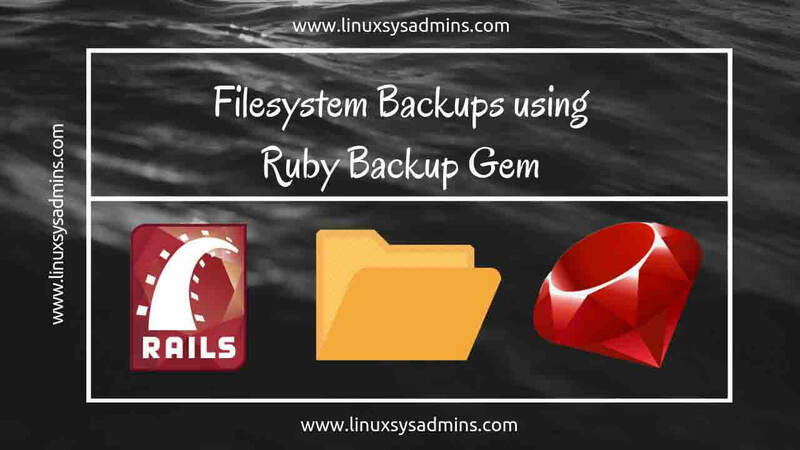 By following which software selection (What type of server need to be installed), Installation destination, Kdump configuration, network configuration and security settings. By clicking on Date & Time from installation summary page we will get Date & Time screen to choose the required timezone and time. 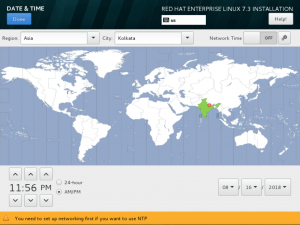 I’m residing in India so choosing the timezone as Asia/Kolkata, By following change the time and date at the bottom. Once all changes are done click “Done” to make the changes permanent. 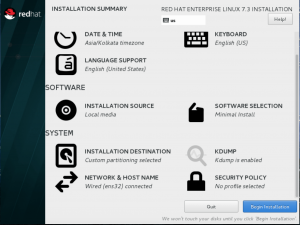 Continue to choose other configurations to click on “Software selection” and choose “Minimal Install” under base environment to install with minimal installation, at last click on “Done” at the left top corner to make the changes and bring back to the summary window. Choosing the installation destination and customizing the required size of the file system is very important. Click on “Installation destination” to choose under which disk the operating system needs to be installed. 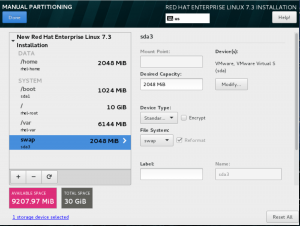 Select the first disk and choose “I will configure partitioning” then click on “Done”. By following we will get manual partitioning screen. Click “+” symbol to add required filesystem mounts. 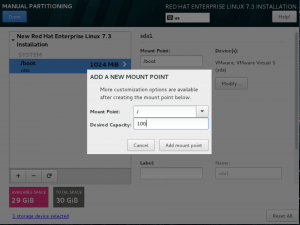 The first step we need to add with /boot partition, Make it 1 GB in size. 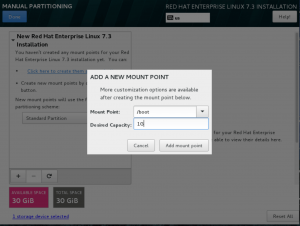 Under mount point choose /boot and Under desired capacity provides the size of 1G. When we provide with “G” it will take it as GB. 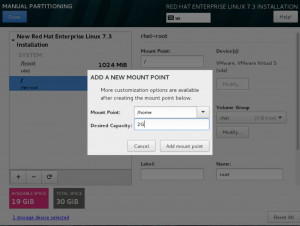 Click add the mount point to add with new boot filesystem. 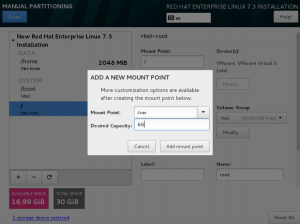 Select the added partition and choose Device type as “Standard” for boot mount point. 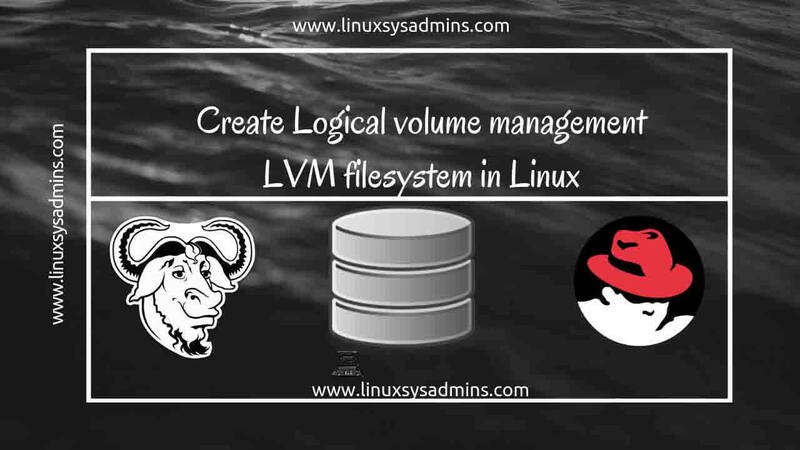 Remaining filesystems will come under logical volume management. By following add / with 10G and device type as “logical volume”. Add /home with 2G, /var with 6G and Swap 2 GB. After creating with required mount points it will appear as shown in below figure. 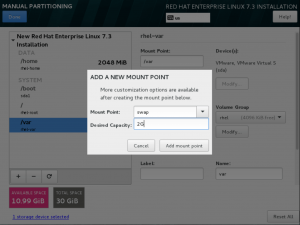 Click “Accept Changes” to create with partition and filesystems. 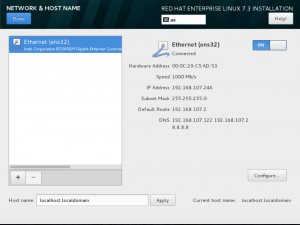 Back to Summary window click “Network & Hostname” to configure with manual IP configurations. 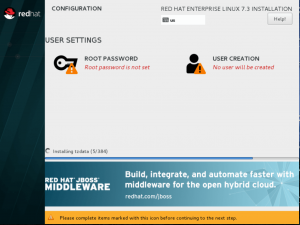 Click configure to continue with configuring interfaces. Under “General” tab click “Automatically connect to this network when it is available”. 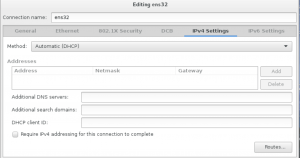 To configure the manual IP select “IPv4 settings”. 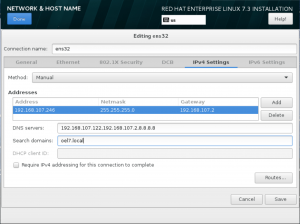 Select manual under method to configure with IP information. Slide the ON at right corner to activate the interface. 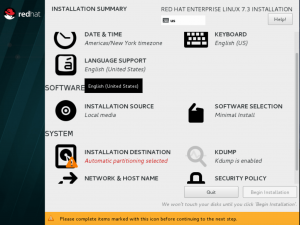 After configuring the required settings Installation summary window looks like below. Click “Begin Installation” which will bring to next screen and ask to create with the root password. If we required with the privileged account we can create one with SUDO. Once installation completed click “Reboot”. A freshly installed system will look similar below before login. Let us log in and check with few commands. 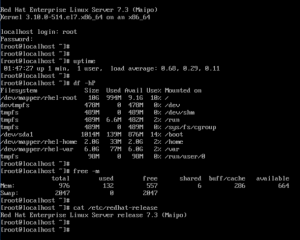 That’s it, We have done with a minimal installation of RedHat Enterprise Linux server 7.3. 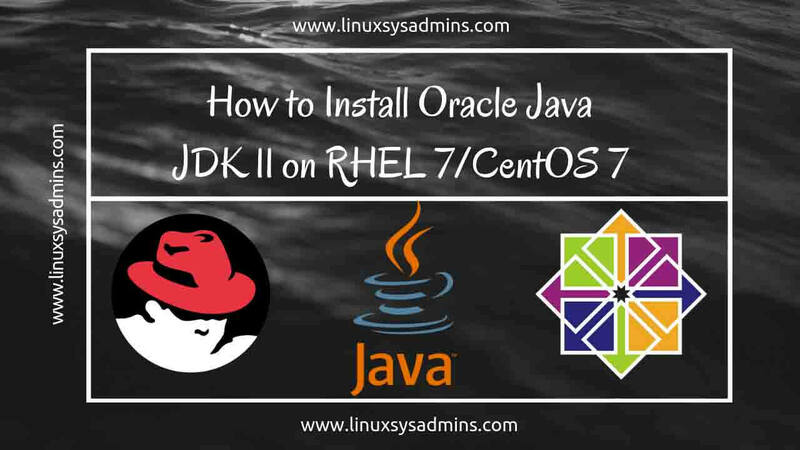 We have successfully completed with RHEL 7 installation, to have a lightweight operating system we used with minimal installation. In case if we required any packages it can be downloaded from the yum repository. 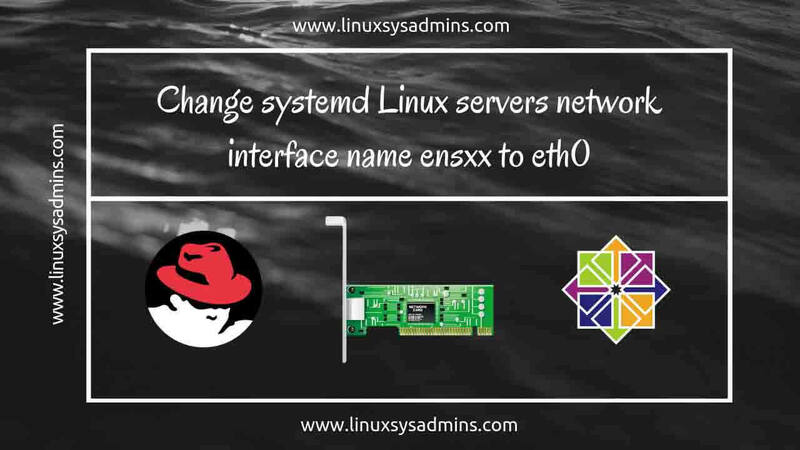 The same steps can be carried out for any version of RedHat Enterprise Linux 7.x server installations. In upcoming articles, more advanced installations and configuration will be covered. If have any query kindly provide in below comment section. We will back to you with appropriate answers.